Aspirin has long been known to provide multiple health benefits: Pain relief, heart attack prevention, and possible prevention of several kinds of cancers. A new study from Stanford University looks specifically at aspirin's role in reducing the risk of melanoma , a form of skin cancer that is on the rise. The study found a significant association between frequent usage of the drug and this form of cancer; aspirin users were less likely to get melanoma than those who did not take aspirin. This is not proof, however, that aspirin is directly responsible for lowering the risk. Researchers believe inflammation plays a big role in cancer development, and aspirin is an anti-inflammatory drug. Previous studies support the idea that in certain kinds of cancers, aspirin may be preventative. "Aspirin also seems to specifically promote tumor cell death in certain cells, and one [type] are melanoma cells," said the study's senior author Dr. Jean Tang, who is an assistant professor of dermatology at Stanford University School of Medicine. Researchers examined data from the Women's Health Initiative, a large sample of women ages 50 to 79 who reported information about themselves for an average of 12 years. The new study looked at nearly 60,000 women in this group. Only Caucasian women were studied because melanoma risk increases in people with less skin pigment, and 95% of cutaneous melanoma cases are found in Caucasians. The study authors divided women into categories depending on whether they said they were taking aspirin, another kind of nonsteroidal anti-inflammatory drug (NSAID), or nothing. A "user" of a drug was someone who took the medication at least twice weekly. Prescription records and bottle labels were checked to verify these drugs. Women also reported their sun exposure, and researchers controlled for this in their analysis. During the period of the study, medical review confirmed 548 incident melanomas among participants. Based on the entire data set, women who took aspirin appeared to have a 21% lower risk of melanoma on average. The longer these women took aspirin, the more protection they had. At one year, they cut their risk by 11%. Between one and four years, it was cut by 22%. At five years and up, risk reduction was 30%. The results did not appear to be different in one age group vs. another, or whether the women had lighter or darker skin or a history of skin cancer. Other NSAIDs and acetaminophen were not linked to melanoma risk in this study. "The results of this study add to the results found by other studies that strongly suggest that aspirin may have anti-cancer properties," Tang said. If aspirin does have this effect, that doesn't mean other NSAIDs don't also work this way. Tang said that the women in the study tended to take aspirin more regularly and frequently than other NSAIDs, so this may have affected the results. Study authors also did not differentiate between women who took painkillers twice a week and those who took them more often. Other researchers are studying aspirin and other NSAIDs for possible anti-cancer effects, she said. Information about the women's sun exposure was self-reported, and their activities were not controlled in an experimental setting. This was also restricted to postmenopausal women; it is unclear what the benefits would be, if any, if women started taking anti-inflammatory drugs earlier in life. But the research is not at the point of recommending that everyone take aspirin every day. Stronger evidence would come from a long, expensive clinical trial to examine aspirin against a placebo for cancer risk prevention, which is hard to come by in the current stringent government funding environment, she said. More: Who should take a daily aspirin? Interesting. Next would be to determine what dosage is sufficient to produce such reductions; is the daily baby aspirin so often prescribed for those at risk of heart attack sufficient? Nice work on the initial study. The required dosage is whatever you can afford to spend. 325mg per day. Too much will cause ulcers. "A "user" of a drug was someone who took the medication at least twice weekly. Prescription records and bottle labels were checked to verify these drugs." What? these drugs don't require a prescription. That's the problem with data-dredging. There were looking at data that wasn't collected specifically with melanoma as a primary outcome and aspirin as the intervention; so the best they can do is find potential associations. It makes a good initial study that should lead to further, more controlled studies, but on its own this will not change clinical practice. Depends where the study was conducted. Actually, the higher doses of ibuprofen (800mg pills) are only by prescription. Since the initial study did not ask 'how much' aspirin, naturally more studies will have to be done. So in some cases, prescriptions are necessary for particular dosages. plushious – Ibuprofen is NOT aspirin. So no scrip needed no matter the dosage. I have long been wondering, since Asprin is a willow bark active ingredient thing, why hasn't the "natural" bark to chew caught on? No packaging. Bad idea. With that, there is no dosage control. Worse, the so-called "natural" bark will give you simply salicylic acid which will kill your stomach. Manufactured aspirin contains an acetyl group that minimizes stomach distress. Not to mention, there are likely other compounds in the bark that you don't need. Not everything "natural" is better. Aspirin is easy, convenient, safe, and dirt cheap. Where is the downside? That's a valid question. One of the primary reasons to *not* chew the bark – aside from the reasons mentioned in an earlier reply is that there is a limited supply of willow trees and removing bark from most trees ends up killing the tree. So they'd need to start planting willow farms to meet the demand. Willow trees require a lot of water so they'd likely need to irrigate the trees. So you'd end up with people planting monoculture willow farms and using a vast amount of potable water in order to produce something that is easily synthesized in a purer safer and cheaper form. What a bunch of bull, i have been taken aspirin for years, and i still got melanoma! A 30 % reduction is not a 100% reduction. Tune in next week, when another study says aspirin is bad for you. Actually, except for people with stomach problems, I am not sure anyone has found a downside to aspirin. @Mel Stricker, ever heard of Reye's Syndrome? tHE MAGIC PILL SYNDROME FITS AMERIKANS TO A "T."
"Those who took a daily low-dose aspirin were TWO TIMES more likely to develop wet age-related macular degeneration. "Wet" is the advanced form of AMD. And it sharply increases blindness risk. Now, two new studies dramatically recharge the urgency of this issue. Number One... About 5,000 subjects ranged in age from 40s to 80s. Researchers gave them eye exams every five years for 20 years. Regular aspirin use was significantly associated with wet AMD. Number Two... A 15-year Australian study included more than 2,300 subjects. One of every four daily aspirin users developed wet AMD. "If you're a regular aspirin user, you should get a thorough eye exam as soon as possible to determine your AMD status." That's stunning. Imagine how many patients would agree to aspirin therapy if their doctors told them they would need eye exams to make sure they weren't going blind. I'm going to guess... Close to zero. Unfortunately, your doctor is probably unaware of this significant danger that lurks behind a daily low-dose aspirin. Crazy as it sounds, you might actually have to deliver this surprising news to him yourself. " This is from the same site that says "Underground cures 'they' don't want you to have... shameful secrets Big Pharma covers up... unbiased health information your family needs now...". Anytime someone says they are unbiased and have secret information the 'Man' doesn't want you to know alarm bells should start ringing. I think it's worth the risk if you're brown or black eyed. Macular degeneration is highly unlikely to occur in people with such dark eyes, even those with a VERY strong genetic link–like me. I didn't see where they mentioned either taking regular Aspirin or 81 mg Aspirin is helpful. If someone were taking Aspirin on a regular basis daily, they could have a lot more problems with their stomach as opposed to being on the 81mg. "Findings" on just about every health issue are always posted....doesn't mean they are right. Studies come and go with no real proof that they actually work. My thought is that the researchers who are doing all of these studies, take the medication themselves and then report back to us. Interesting comment....I have been taking low-dose aspirin every day for about 3 years.....Lately my eyesight has been getting worse and worse. And it is worsening very quickly. Thanks for the information. Time to conduct my own test! Thats just called, "getting older". I see this article as more proof that chronic inflammation is the cause for many of our diseases. IMO, our chronic inflammation is caused by a modern Western diet that has our fat intake out of balance. Our Omega 6 Fatty Acids are way to high in our diet compared to our O3FAs. O6FA cause inflammation, O3FAs are anti inflammatory. We are what we eat. Apparently not. Recent studies of mummies shows that inflammatory arterial disease was as common several thousand years ago as it is now, and occurs at similar rates in widely separated cultures such as Egypt, China and South America. Aspirin makes you more sensitive to the sun worsening your threat of getting melanoma. Reading comprehension isn't your long suit, is it? LOL. Yep... and no mention of the long term adverse effects of aspirin or the fact that many children die due to accidental pain killer ingestion! I take aspirin all the time. I use Ecotrin ( a brand name) because you can take it on an empty stomach. It takes a little longer to work (because it is coated) but that is fine with me. I don't take ibuprofen and especially not taking acetaminophen (things like Tylenol) because the damage these drugs can do to your liver (this is even noted by the company). Aspirin has been around for a very long time. The side affect benefits are unbelievable. The only time I do not take aspirin is when I might have an operation. Other than that aspirin is the wonder drug of the ages. No cause-effect effect results here. Too many variables uncontrolled by the investigators. Poor study design. Keep trying, gentlemen/women. How is it 'poor'? Simply tossing out unsupported claims doesn't do much to shore up your assertions. Ever heard of something called an advertising agency? It's a cheap way to get a lot of health benefits. I take an 81mg. coated aspirin once a day for my heart. If it can protect against Melanoma that's great. My best friend died at 30 from malignant Melanoma. It was not pretty. One of many problems with WHI studies is the self-reporting. I would probably answer "yes" when asked whether I take aspirin regularly, but the truth is I forget to take it (a daily prophylactic dose) quite often. I haven't trusted WHI data since their big "hormone replacement therapy causes heart attacks" error. They caused a lot of middle-aged women a lot of pain that was not necessary. Me included. With melanoma in particular, the advice from physicians and researchers has long been that if you are genetically prone and have had excessive sun exposure in early life you are already on the road to melanoma. All you can do is monitor skin changes. So how can a passive data study (self-reported data) determine that aspirin taken after the exposure to solar radiation puts a stop to a progressive mutation? Correlation doesn't prove causation, and all that. It's this thing called "statistics". Although you're right that this doesn't prove causation, NO epidemiological study can do that, and until we decide we're OK with human experimentation, that's the best tool we have available. Meanwhile, a 30% reduction is hugely significant, and can't simply be ignored, no matter how strong your Luddite tendencies might be. According to the article, this and other studies have shown that aspirin can cause the death of certain tumor cells - so yes, this might be possible with melanoma/premelanoma cells. Six Degrees, you need to learn some manners. Or grow up. Or both. endeavor43, it also states that although the study found an association between aspirin use and a lower rate of melanoma, "this is not proof...that aspirin is directly responsible for lowering the risk." This is nothing more than a loose corellation. No answers from you, I see. Is there anything aspirin can't do?!? Make someone like Six Degrees stop acting like a di@k.
I'm 70 years old and take aspirin for 30 years on a daily basis to prevent heart disease. In 2012, I had a skin cancer (Clark II) on my arm. And...what, exactly? Is there some point to this tale? Since aspirin is so useful we soon will need a prescription from the doctor to get it. Some of your comments show intelligence. Stick with them, they serve you better. Contrary to the general belief, the Salix tree bark does not contain "Salicylic Acid" (the synthetic precursor of Aspirin). It contains salicin (a glycoside of salicyl alcohol), salicortin and leiocarposide (esterified glycosides of salicyl alcohol). In addition, it contains other beneficial antioxidant compounds such as procyanidins. Salicylic acid simply forms in the intestines when gut bacteria hydrolyze and then oxidize these natural glycosides. This is very interesting and provocative study, and builds on work reported last year. Still, we don’t yet have the evidence to tell us what this information means for people or why aspirin would have an impact on melanoma incidence. What we *do* know is that the majority of melanoma cases in the United States are tied to UV exposure and that nothing suggests taking aspirin replaces a good, common sense decision to reduce your UV exposure. Sun safety is critical in preventing a melanoma diagnosis. This means skipping the tanning bed, wearing at least SPF 30 sunscreen, UV protective clothing and checking your skin. 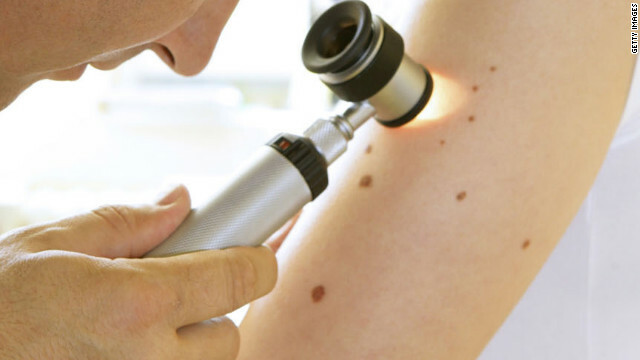 Looking for any changes in your moles can mean an early catch that can save your life. The Melanoma Research Foundation, http://www.melanoma.org.